THIS BANNER WILL APPEAR AT TOP OF EVERY PAGE! PLEASE, SCROLL DOWN FOR CONTENT BETWEEN PAGES- THANK YOU FOR VISITING! Ever wanted to commission a TRULY UNIQUE work of Art for your home or business? Well now you should. 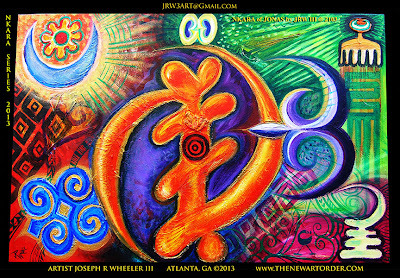 Commission an ORIGINAL work of ART by Artist JOSEPH R WHEELER III. Whether a drawing, painting, collage, or even photography(details coming soon) - the possibilities are endless! Works can be tailored to your taste with consultation from the Artist in negotiating the most impacting final piece. A new series dedicated to African Symbolism and universal codes of symbols are a recent focus in the Artist's work and Mr. Wheeler welcomes you to explore what YOU would look like in symbols from the Mother Land (Africa) and abroad. This work is entitled "NKARA of JONAS"(A special dedication to the collectors' family - Dr. Edward Jonas and Mrs. Veda Jonas of Atlanta, GA) and it is the 1st in this special series. It features Adinkra symbols which originated in Ghana (W. Africa) via the Akan peoples and their neighbors/kin ethnic groups. The word Adinkra is said by Ghanaian scholars to have origins in the word AKRA or NKARA which is the very spiritual intelligence that everyone departs from the heavens with to make journey to earth and start the path of LIFE! 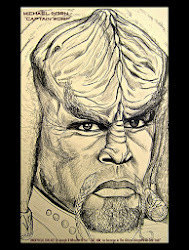 The African Diaspora on STAR TREK - A FAN ART PROJECT! Celebrating The Impact, Contributions, & Presence of The African Diaspora in The Popular Arts!